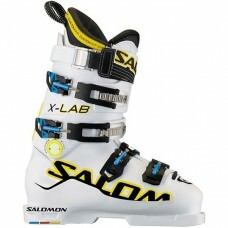 110 Flex Rating: Higher than average stiffness means you should be skiing pretty fast to warrant a boot of this flex. 95mm Last Width: This last provides a race style fit, which means its narrow and the opposite of roomy. This should only be for advanced to expert skiers that either have narrow feet, or can endure the pain of narrow boots. 45mm Strap: Super wide strap found on high performance boots. The extra width spreads out the force while skiing and reduces the pressure point on the upper shin. Two Bolt Flex Adjust: One or both bolts at the back of the boot spine can be removed or added to adjust the flex of the boot. The boot is softer when the bolts are out, and stiffer when screwed into the shell. Custom Race Kit : These boots take some work to get them to fit comfortably so Salomon has included some accessories to help in that process. Additional Sets of Shin Plates, Rear Spoilers and heel lifters come inside the box. Shin plates reinforce forward support and stiffen flex while rear spoilers increase forward lean by 2Â° and adjust height. Heel lifters improve skiing stance. World Cup Advanced Shell Technology: This is a more powerful version of the Advanced Shell technology with improvement on the back support, the body positioning into the boot and the torsion control of the boot. This kind of construction is designed to transfer the maximum of power from the skier to the ski. Backbone Technology: There is a magnesium piece linking the upper cuff to the lower shell providing back support for better rebound coming out of the turn (rebound effect) and enabling a progressive but powerful forward flex. 24mm Oversize Pivot: Significantly larger than standard canting bolts, Salomon's 24mm Oversized Pivot helps align your boots for the most precise and efficient energy transfer between your boot and the ski. The larger diameter helps with wider skis since the torque on your boot is much higher. My Custom Fit Race Liner: The best liner in Salomon's line, it will mold to the skier's feet but isn't too cushy so its response in combination with a stiff shell will allow the skier to ski as aggressively as they can.